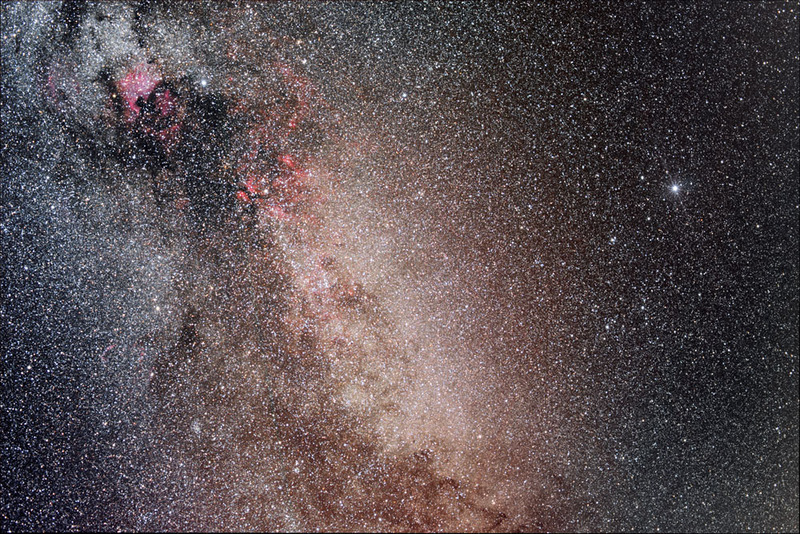 This wide field image shows the area of our Milky Way galaxy which extends through the constellation Cygnus. Many red emission nebulae are visible including the Butterfly Nebula and the North America Nebula. The dark area below the North America Nebula is known as the Northern Coal Sack. Note: This picture was featured as ATWB Photo of the Day November 19, 2006. Note: This image won 1st Place at the 15th Annual Regional Meeting of Amateur Astronomers for category "Other, CCD"
Note: This image won 1st Place at the 2007 MidAtlantic Star Party (MASP) Astrophotography Contest.